Mediterranean Sea stamps and P.H. Multiple franking is often spectacular. Many collectors will pay particular attention to such items. This is particularly the case in Germany and in the German-speaking countries but also in Anglo-Saxon countries. Thus the Michel Catalogue rating this type of postage usually gives important added value. It is all justified more easily that finding this kind of documents is sometimes very difficult. Multiple franking, means a composition of a single value, stripes, blocks or more isolated copies of the stamp, without the addition of other values (in this case one speaks of mixed franking whose value, unless facing an exceptional postal rate, are much lower). To give a hint of scarcity, you should know that it is necessary to handle hundreds of letters to hope to find one, and I am far from exaggerating. It is necessary to be armed of a lot of patience to find some. UNESCO is a specialized agency of the United Nations (UN). Its purpose is to contribute to peace and security by promoting international collaboration through education, science, and culture in order to further universal respect for justice, the rule of law, and human rights along with fundamental freedom proclaimed in the United Nations Charter. The General Conference is the main body of UNESCO. The General Conference determines the orientation and the general line of the organization. It meets annually in ordinary session during the fourth quarter. The seat of the session changes each year. In July 1938, the FIGARO newspaper reported in a dispatch that mail from the Levant was stamped with stamps celebrating the 10th anniversary of the Aéropostale Marseille-Beirut air route. As a matter of fact, Lebanon post office issued on the 15th of July a stamp (Fig.1) and a souvenir sheet (Fig.2) celebrating this Aéropostale flight. 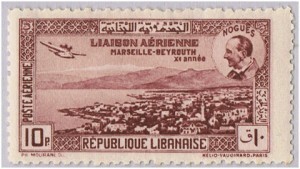 The stamp depicts a CAMS-53, seaplane flying over Beirut and the figure of Nogues. 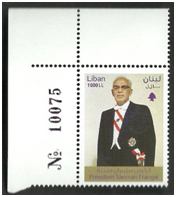 On June 2011, Libanpost put into circulation a stamp to honor President Sleiman Frangieh, nearly 40 years after the end of his mandate! 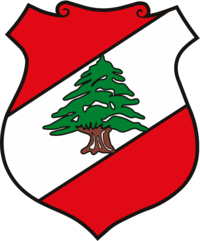 Mr. FRANGIEH was Lebanon’s president from 22 September 1970 till 22 September 1976. 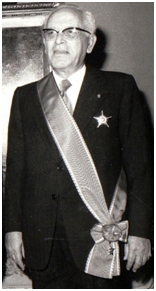 Sleiman Frangieh’s Presidential portrait, 1970.